So What’s Up With the DAX? 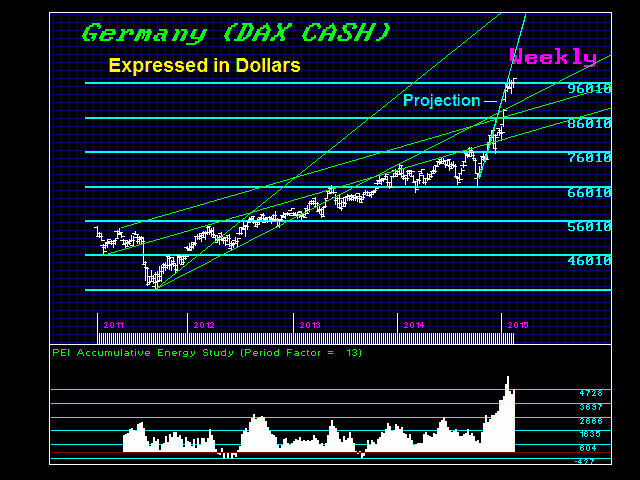 Previously I have warned that the DAX would press higher as the object of capital flight within Europe. 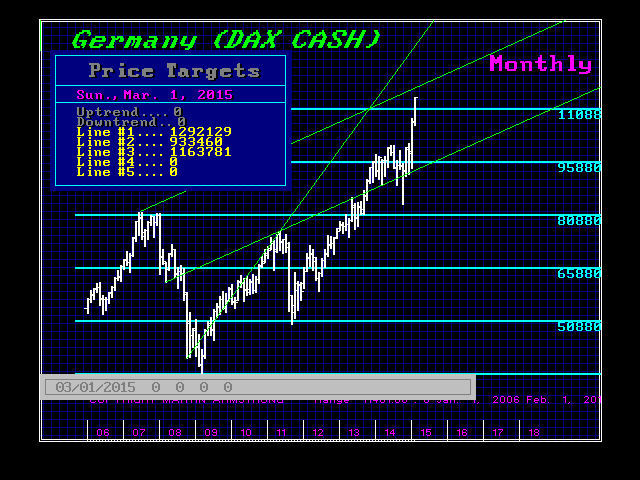 The problem we are facing is that the DAX could peak-out with this ECM turning point. If this were to unfold with a high in the DAX to the day of the ECM, this will be the kiss-of-death for Europe and it would be the strongest possible warning that a dollar rally will create massive deflation ahead. We can see our Energy Models are pointing to a run-up that is more indicative of a serious high forming rather than just a temporary high. We still see March as a key target and advise our European readers to pay close attention here as we move into the next couple of weeks. As we look into March, we can see the technical resistance begins at 1163781 level on a broad monthly basis. This is the next target area for a high. 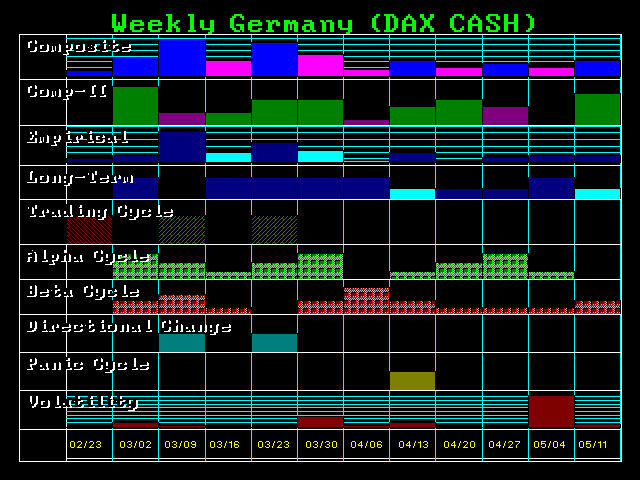 Looking at the DAX in dollars, we can see here too we are following the Projection on the Weekly Level rather closely. 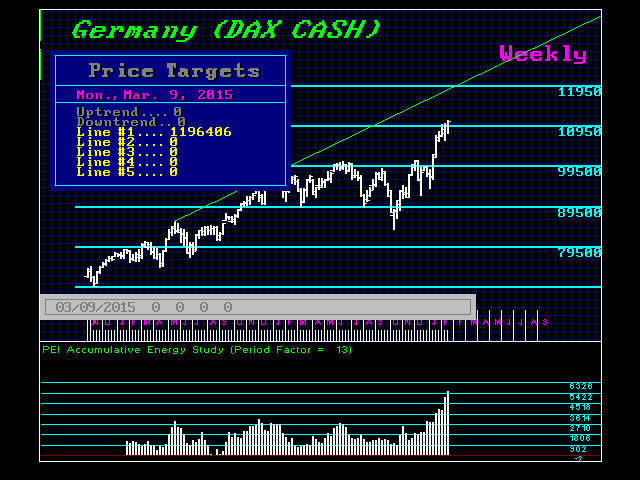 Our Energy models are warning also that the DAX has entered the danger-zone for a serious high. There remains the possibility that 2015.75 becomes as an important high for Europe as the EU is fighting a losing battle. Brussels is destroying the European economy – not lifting it out of trouble. What we are looking at here is perhaps a precursor to the next very serious Great Depression with unemployment at twice the level at a minimum compared to where they were BEFORE the Great Depression that began in 1929. Another very serious marker is the fact that 1929 to 2015 just so happens to be 86 years. This is the TENTH 8.6 year wave. 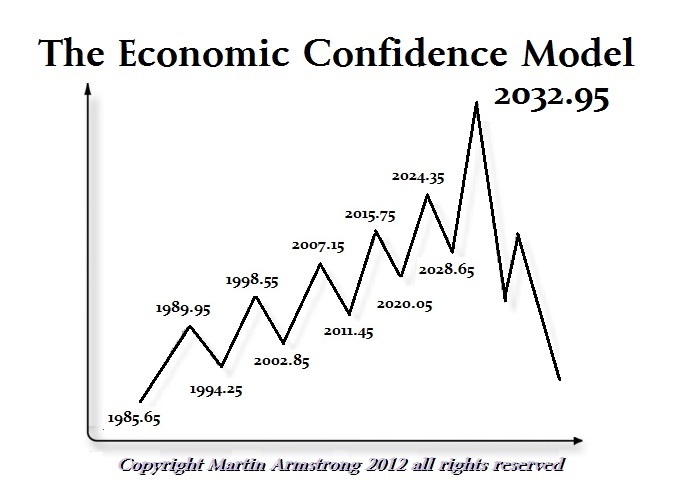 This warns that what comes after the TENTH Wave historically is major change. This is WHY we have been warning that 2015 was the start of BIG BANG. A lot of people have sent in links to suddenly a bunch of people trying to mimic our models. That is all they can do for the ONLY reliable aspect is the ABSENCE of Human Interpretation. Standing on one’s soap-box and pretending they have some fantastic model combining various forms of analysis is cute. But as long as there is human interpretation required, there is human error. Nobody can forecast what they have not experienced from a personal wisdom perspective. Their interpretations typically follow some preconceived vision of the future and therein lies the entire problem. The more they pretend, the greater the risk that when it comes time to try to take that step forward for society, these types of people will only discredit any advancement. They do far more damage to society as a whole than they will ever contemplate while trying to get rich. You cannot advise others if you have not done it yourself.